World map is not updated, and your API proves it. Many times players asked for an updated World map, notably by adding recently covered countries (ex: Sri Lanka, Kyrgyzstan, Senegal, Ghana, Guatemala...). Usually you answered that those countries are already in the World map, but aren't picked often because of their small size or small coverage. But, by asking lot of regular players and streamers, it is obvious that some countries never appears, or with photospheres instead of official Streetview. As you can see, it shows a pretty accurate representation of what the World map usually gives. But you can also see some countries that are never selected despite of having Streetview; Guatemala being the obvious one considering its pretty good coverage. By looking at the date of every country's first Streetview addition and crossing the data with the locations, I estimate the last time you updated the World map somewhere between December 2015 and February / March 2016. The most recent country that is on the World map is Uruguay (added in December 2015 on Streetview), all the newer countries are not on the map, except with photospheres that were uploaded before 2016. • South Korea's coverage was only Seoul and Busan areas, but in June 2017 many more areas were added. In the latest World games, all locations outside of Seoul and Busan are photospheres, despite of Streetview being right next to them. Only the location in Jeju island isn't a photosphere, but it is a beach trekker view taken by Google few years ago (May 2014). I got it multiple times already. • Indonesia coverage consisted of Sumatra, Java, Bali and the island east to Bali for a long time. Since, Google covered almost all the other islands, including the big islands of Kalimantan and Sulawesi, but your World map never picked a Streetview there, only some photospheres. Same for all the other islands. 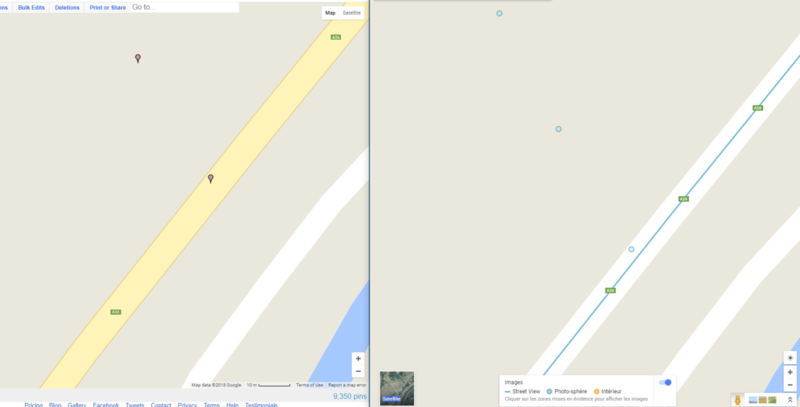 (also notice the two locations selected there, very close to each other, are photospheres). And what about Malta, that never get selected despite of a very good coverage, when the small Italian island of Pantelleria west of it got 3 selected locations? When checking the locations, to see if there were photospheres, I even recognized many of them that I already got before (the one north on Philippines, the one in West Sulawesi...), which make us think it's like a predefined list of locations. The excuse of "small country / coverage" doesn't work there. See the location in Uganda? It is a regular Streetview location. Uganda's coverage is only the capital area (Kampala - Entebbe), way smaller than the coverage or Senegal or Ghana, or even Lagos state in Nigeria. So why those countries never get selected in more than 9000 rounds? It just can't be "luck". So yes, there is an update needed on the World map. Everything there confirms. Many players ask for it. Big streamers playing the game on Twitch talk about it. Geoguessr is getting more and more visibility from big youtubers and streamers, it would be sad to see players going away, tired of getting the same countries and never getting new places to visit. It's not only a matter of 1% of the player base from a subreddit, but the whole player base that is affected by this. We really hope you'll finally do something about this problem that has been there for almost 2 years now. Thank you for reading. Thanks for the, as always, well written post. To start with, we don't have a limit on the location selection in a way that we add/remove specific countries to the selection pool. Because of this the entire world is, in theory, available in the world map. However, before a location is added to the world map's location pool it has to be vetted by our system to make sure that we only use valid locations (for example to minimize the problem with "black locations"). This is done through a system that semi-randomly check locations from a certain area - if the location is ok it is added to the location pool, otherwise it's discarded. At the moment the location pool contains over 10 million locations. When we looked at the (very informative) maps you provided it seemed pretty clear that there was something wrong with the location selection and upon further inspection we noticed that there were a lot of vetted locations that hadn't been added to the location pool. Because of this we have now rebuilt the location pool for the world map which should ensure that all of the vetted locations are now eligible to be selected in the games. There might be some countries that are still missing locations and we'll need to look further into that, but the location pool should at least now be significantly larger for the "new" countries than before. Also regarding the API. This API is something that the service uses internally and is not something that we think of as a public API. The reasons for keeping it this way are many but the main one is that we need the API to be able to change at any time. Something that is much harder to achieve with a public API which have third party services depending on it. There are also possible performance issues that needs to be taken into consideration to a much greater extent if we were to make the API public in the true sense. It's not impossible that we'll release a "real" public API in the future but it's not something that we prioritize at the moment. Thanks for bringing this to our attention and for the thorough investigation! Our best to the GeoGuessr-subreddit as well, it's always inspiring to read what you guys post there! Thank you for updating the map pool. I can already confirm new countries are now appearing sometimes, which is fine as they can be harder sometimes. We'll run the script to gather the data and make a new map to see the differences! I would like to know, about photospheres that are very close to regular coverage (like the Sri Lanka one I showed in my message), are they removed by your system if it detects regular Streetview around? There is this photosphere in Appenzel, Switzerland, that is surrounded by regular Streetview and being stuck in it isn't great (even if I could find the place by looking at the houses around). In my opinion, photospheres should be avoided as much as possible in areas covered by regular Streetview as they can take time to load (sometime they just won't load) and block all movement. Best would be no photosphere at all but I can understand you want to cover the whole world as much as possible. But usually people are annoyed by photosphere... I'm watching a Geoguessr stream while writing this and the streamer got another Indian photosphere with no clues, which annoyed him a lot (and hit that 1-star rating so hard). Speaking of rating, is that used by the system to automatically remove bad rated locations? We still have no idea about the impact of rating a place 1-star. And when new places are added on Streetview, do you need to manually run the update? As for the API, it would be great to have one in the future. I would like to query a few data, like the number of played games and likes from custom maps. Maybe we could generate custom maps this way too, instead of using the map editor... That could open so many possibilities. Great that the changes so far seems to have some effect! Regarding photospheres it's a balance. Overall we'll try to avoid photospheres but the main problem is detecting photospheres in a reliable way. Photospheres that only covers a specific spot without the ability to move around are fairly simple to detect, while photospheres that cover a larger area are harder (you can argue if these really are photospheres, or something else). We also know that some players likes the photospheres while others don't, so we also don't want to remove them altogether. Do you have a link to a game with the Appenzel-location? It would be interesting to take a look! At the moment we're using the rating system for some planned features that aren't released yet, but we're also planning on using them for removing particularly bad locations as well. One of the main decisions here that we need to make is where to draw the line of how many reports is needed before we remove a location. Yeah, I agree that an open API could be really cool, and super interesting to see what all of you very creative players would be able to do with it :). As of now we have to prioritize other things above this, but hopefully we'll be able to release this some day! It was one day before you updated the World map, maybe it's not in the game anymore. This is probably not your system's fault, but Google's fault because they randomly remove small bits in the coverage without reason... You can see on Maps the blue line scattered around. On my custom world map I have to move pins regularly to fix black screens caused by removed Streetview. By checking other maps with the same technique I can see Japan map is missing some coverage (sometimes from late 2014), since this map was added on July 2014 (when the retro website got replaced) I assume it never got update. I guess other maps (especially the older ones) may have some missing coverage added since by Google. Town maps seems to be fine since they were already almost 100% covered (Paris still have tons of locations outside the actual city limits though). EU and Famous Places are probably hand-made maps so they're not concerned by this. I think it would be good to update the maps automatically on a regular basis. I would say 2-4 times per year is enough for country maps as those countries usually don't get major updates now (Google mostly updates existing coverage), and once per month for World map since new countries are regularly added by Google. Thanks for bringing this up, I'll look into the other maps that you brought up. We're currently investigating why the maps doesn't pick up on the new locations (which should happen automatically) but in the meantime we might need to force an update manually as you said!